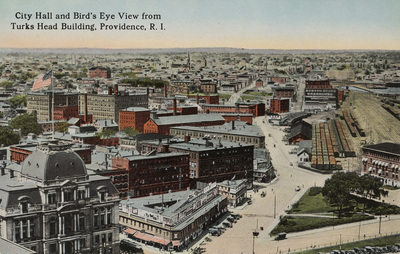 "City Hall and Bird's Eye View from Turks Head Building, Providence, R." by Berger Bros., Providence, R.I.
City Hall and Bird's Eye View from Turks Head Building, Providence, R. I.
Berger Bros., Providence, R.I., "City Hall and Bird's Eye View from Turks Head Building, Providence, R. I." (1915). Rhode Island Postcards. 68.